“Emil Băcilă is an active presence at artistic events in Cluj […] The painter presents a great and significant personal exhibition, a selection of works in mixed media (watercolor and tempera) realized during the past years, linked under the sign of plastic image. This unity recommends itself through a synthetic spirit, through a force of the expression’s materialization and preference for styling, a fact that imprints on the images a pleasant decorative effect. Apparently reductive as area of representation – the preoccupation for the nature remains a constant – the art of Emil Băcilă is far from remaining at the level of registration and transposition of the evanescent moment. It deepens powerfully into the essence of prospective facts, so that subtle references to the human condition and permanence reveal in an obvious way when pursuing aspects from the life of plants, fields, views or fragments of the micro and macro cosmos. A delicate and sensitive temperament, the painter differentiates the atmosphere in tones so that his landscaping symbols intercept and underline in a convincing manner the specificity of local color. In a few scenes from Venice, he refuses the fidelity of details. The picturesque of the mood is rendered here through the striking of chromatic characteristics of various moments of the day: whether red-violet, or white-pink or white-soft marble grey, flooded by the reflexes of a discrete, vibrant, and aerial light. From time to time one may notice blurry architectonical fragments, transparent, and rhythmically inspired. In exchange, Umbrian Scenery surprises us due to the incandescence of an explosive red, as the time of dusk receives – due to a refined grading of tonal quenching – a unique charm. When Emil Băcilă traveled in to northern Moldavia, the landscapes he saw there made him change his chromatic registry. The sky’s crystal blue interferes with the raw, powerful green of coniferous trees and with the musical brownish-red that reminds us of the patina of medieval frescos. The dynamics of horizontal lines or of curbs curled by a uniform color resonates with the rhythm of popular songs, sometimes slow and pathetic, sometimes vivacious and exuberant. In Poppies, the stylized corolla perform a rotating movement reminding of the symbolic of the frequent motif of the circle (representing the idea of play, sun, etc.) and the composition Monument impresses the viewer through its impetuous vertical accent of the towers (which synthetizes aspirations and fulfillment), while the chromatic ambiance becomes sober, solemn. “[…] Emil Băcilă belongs to those artists for whom all possibilities, all distinctive means of painting are subordinated to one direction: chromatic harmony. He is connected through all his training to this traditional aspect of Romanian art. Taking-over, as an absolute note, the sense of harmony though color, he compiles his works starting from the suggestions of reality whereto he attributes forms that tend to satisfy the imagination of the contemporary individual. Even though he does not set the real into details, he reaches a chromatic synthesis through a successive decantation of the plastic essence. […] The flowers that form the main theme are the universal symbol of human feelings, offering a great wealth of interpretation nuances. He tries to imprint the harmony suggested by the flowers on humanity, on the sorounding ambiance. He appeals to the oval as a synthetic shape of the flower or sometimes to the construction of lively spots and backgrounds, in close cadres, that assume the harmony of these color constructions. He is preoccupied with aspects of human evolution, by giving a poetry touch to the precise images of technique, to the future cosmic interiors. He always uses color as a remedy to all these geometrical constructions. In the Venetian sceneries we find the accentuated underlining of sensations that become symbols beyond the details that melt in a pathos of an intense experience. “[…] His suggestions come from reality, with the fugitive moments capture rapidly, or with the debate of some matters especially important for the future of mankind; his love for harmony – that he builds step by step – comes from that world of Romanian traditional art in the middle of which he was born and which he continues to search and experience. […] The accomplishment of each work exceeds the strict limits of a given subject; all make references to a large circle of sensations and ideas that directly or indirectly contributed to the accomplishment of the work. In his flowers – the favorite theme of the artist to express his harmonies – the artist renders the universal symbol of life which he seeks to translate into the conception of tomorrow’s dwelling, the cosmic space where the next generations will live. The Venetian scenes with their suggested details become the symbols of unique experiences, of a specific mood that any visitor of the lagoon city takes with him. “[…] Emil Băcilă is present in several collective fine arts events with pieces that demonstrate a consistency towards a certain area of inspiration and towards the essence of a long-lastingly and originally configured vision. A vision which rests on a strong sensorial substrate, as the subjective impulse reveals the fascinating universe of a delicately poetized nature. Because Băcilă’s work preserves an undeniable respect for the suggestions offered by the immediate reality, achieving to transpose his excitement through discrete harmonies and the search of some refined tones. […] Emil Băcilă converges, through his language, to an optical synthesis that suggests more than it depicts. He charges emotionally the image whose generalization effort goes so far as to sacrifice actual elements of the motif in order to offer us the dynamic of energies beyond appearances […]. Through such a stylistic process, the surface is simplified and receives an accuracy owed to a fair graduation of plastic dominants. A sensitive colorist, Băcilă uses easily a rich chromatic registry, preferring warm harmonies revealing the Latin roots of his nature. 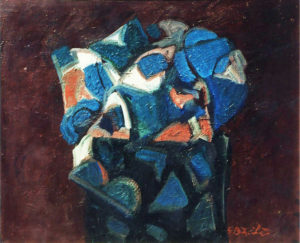 “A sensitive painter with delicate emotions, being away from the enthusiasm for great constructive compositions (a gender that he practices quite rarely), tempted by the elegiac “cameral” tones, Emil Băcilă is interested in the expression of a melancholic tenderness which finds the right expression in the motif of flowers, as a symbol of the existence which strives for modesty, privacy, meditation, satisfied with savoring discrete nuances, with the nobility of the indrawn sentimental gesture. This lyricism converts into tones of grey, green, brown and yellow faded not by the dusk’s light, but by a quiet interior. This silence – wherein the form of the object tends to melt in the atmosphere of the interior, in an empty materialzed space, so the ratio of colored surfaces becomes more important than the outlines (objective existence) of flowers – is ruled by a single vibration, by an almost monotonous sound, by a sing-song, a serene melancholy that refuses brightness, chromatic vigor, pure and bright sounds. “[…] Emil Băcilă comes from a world guarded by the quiet and fruitful hills of the Tarnave. The city of Blaj of Timotei Cipariu and Ioan Micu Moldovan is the starting point in his life. And, if his art is built on the coordinates of rigor, this means that the first years, with teachers that always acclaimed the spirit of the Transylvanian School, have marked in a benefic way the formation of the man and artist Emil Băcilă. The way of art goes from the fidelity to detail to a deep understanding of light and atmosphere. Even a summary glimpse on the Venetian or Romanian landscapes leads us to believe that Emil Băcilă had a deep understanding of nature. “[…] Emil Băcilă is not just a creator, during years of teaching he formed many generations of artists, by conveying his vision and new methods of artistic knowledge experienced through the complex language of modern art.